Social-, open access-, information- and cloud-based driving forces of change, combined in a digital business ecosystem (DBE) that includes both producers and consumers creates a new model: a community-based DBE. This “CDBE” drives forward the goals of an integrated community that benefit all concerned. The sciCloud.net® Informatics Platform CDBE is not only the framework for the entire scientific, medical and laboratory community, but also all of LabLynx’s products and solution packages. It is at the heart of LabLynx operations themselves. It is dynamic, community-based and therefore intrinsically automatically responsive to the needs, preferences and trends of the community itself. As standards grow and improve, resources and information are exchanged, which are in turn adopted into the infrastructure itself in the form of apps and services, and support for the goods and services — and people — who are active in that community. As the community grows and changes, so does its platform. Community Members – Everyone who wants to be a part of the community can be. It’s free and comes with an assortment of benefits and privileges, with access to additional goods, services and resources. User Groups and Projects – For every app there is a user group. In fact, groups can be made by anyone for any special interest, and users may join and make use of specific resources, information and events. Using the free electronic laboratory notebook (ELN) and Open Science Framework (OSF), members can create and manage research or other projects and studies. Application Users – The many free and premium apps in sciCloud.net® are there for the convenience of the community members, and they go far beyond simple, discrete, standalone apps of the past, providing a cohesive solution for managing all aspects of a lab or other organization. Open-access Content – Open access means the information, apps, resources and news are all provided. To paraphrase a great American president, the content is “by the community, for the community”. Developers collaborate on source code and support efforts, while members share their knowledge, publish research and experiments, discuss topics, test apps and concepts, and in fact evolve the community as well as its platform. Career Opportunities – sciCloud.net® is all about the people, and that absolutely includes sharing job opportunities and providing the means to search for appropriate career placements. It’s all tailored to your specific criteria. Business Interactions – Again, the community platform is people-based, so it’s people doing what people do: commerce and business. Some have products or expertise to sell, others need them. The sciCloud.net® community platform fully supports these interactions, without allowing them to descend into shameless advertising and spam. Receive only the kind of communications you want to receive, and target only those who have a bona fide interest in what you are selling. Information Sharing and Access – Open, accessible, collaborative: these are the descriptive terms that repeatedly appear in discussing the LabLynx, Inc. sciCloud.net® community and platform. It is all about the free sharing of information to the benefit and growth of both individual members and the community/industry as a whole. As early as 2014 (and undoubtedly before that), it was beginning to become clear to some that standard business models are being rapidly relegated to obsolescence, and that inclusion of customers, consultants, and even competitors and other members of the industry/community must be incorporated in a holistic model, similar to what we have described (see infographic). Community Interactions: Link up with others in group discussions, search for people and companies, form and participate in local groups, projects and more. Cloud Apps: Take advantage of free cloud-based applications at sciCloud.net®. Marketplace: Get used or new equipment and supplies, free buyer’s guides for apps, services and products, and more. Opportunities: List openings and search for people to hire, or search for career opportunities yourself. Put out your shingle to do freelance or contract work in the community, find or list bids, projects and other opportunities. Publishing buyer’s guides through the Laboratory Informatics Institute and community, featuring specs, comparisons, pricing and other valuable information about any of the various apps used by the community. Services, consultants and more will also be covered in future guides. Developing and hosting LIMSforum.com, a former LinkedIn group turned industry portal, offering more features and functions and fewer restrictions. It was created to facilitate the exchange of ideas and technical information across the fields of laboratory, science, and health informatics. ↑ “Digital ecosystem”. Wikipedia. https://en.wikipedia.org/wiki/Digital_ecosystem#Digital_Business_Ecosystem. Retrieved 7 October 2016. ↑ Hinchcliffe, D. (12 May 2014). “Defining the Next Generation Enterprise for 2014”. On Digital Strategy. 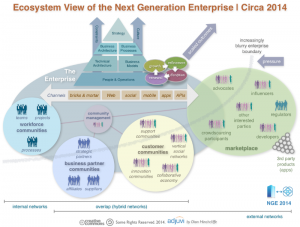 https://dionhinchcliffe.com/2014/05/12/defining-the-next-generation-enterprise-for-2014. Retrieved 7 October 2016. ↑ “LIMSfinder Home”. Laboratory Informatics Institute, Inc. http://www.limsfinder.com/Home.aspx. Retrieved 7 October 2016. ↑ “The LIMS Book”. Laboratory Informatics Institute, Inc. http://limsbook.com/. Retrieved 7 October 2016. ↑ “Lablynx – latest company news”. LaboratoryTalk.com. 25 August 2009. Archived from the original on 19 April 2012. https://web.archive.org/web/20120419143627/http://www.laboratorytalk.com/news/lbl/lbl103.html. Retrieved 7 October 2016. ↑ “LiMS forum – Laboratory Informatics Institute user’s group for LIMS, Scientific & Health Informatics”. LinkedIn.com. 22 October 2011. https://www.linkedin.com/groups/2069898/profile. Retrieved 7 October 2016. ↑ “LiMSuniversity.com, the on-line, Open Access, Virtual Learning Center for Laboratory Informatics users and professionals”. Laboratory Informatics Institute, Inc. 4 April 2011. http://www.limsfinder.com/BlogDetail.aspx?id=35134_0_25_0_C. Retrieved 7 October 2016. ↑ “LIMSwiki mission”. 2 June 2011. http://limswiki.org/index.php/LIMSwiki_mission. Retrieved 7 October 2016.